Recently I got to hear this new term . ”OAuth”. I was reading some articles and watching some videos which was quite helpful for me .I thought of sharing this with you guys too. OAuth(Open Authorization) is an internet protocol for creating and managing App identity. It is a cross platform mechanism for authenticating and authorizing Apps. [I don’t want to deviate from the main topic here. I will blog about Apps in a different post .In simple words Apps are self-contained pieces of functionality that extend the capabilities of a SharePoint website].OAuth is an emerging internet standard already used by social networking giants like Facebook, Google and Twitter. Authentication Server - Trusted server that authenticates Apps and creates OAuth tokens. 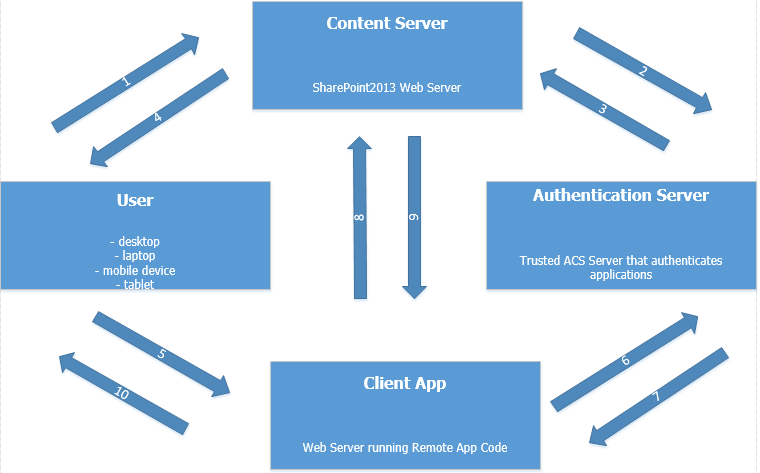 ACS is required for OAuth implementation in SharePoint2013.ACS acts as an authentication server. It should be trusted by the Content Server and the Client App. ACS is automatically configured for sites in Office 365 tenancy.In the case of an On-Premise farm, a trust to ACS must be configured with PowerShell. This can be done via PowerShell too. AppID (Client ID) - GUID to identify application. AppSecret - Signing key to sign, encrypt and decrypt messages. Both ACS and Client App would have App Secret. AppSecret is a Base64 encoded string. Title - Title of the App. App URI - Base DNS name to get to the App. 4. SharePoint pass context token to User. 5. User POSTS to Client App passing context token. 6. Client App is able to pull refresh token out of context token. Client App then passes refresh token to ACS to request OAuth token. 8. Client App makes CSOM/REST calls to SharePoint site passing OAuth token. Note: ACS and OAuth can be used in Office 365 and in On-Premise farms.Trusts to ACS already configured for Office 365 sites. On-Premise farms require explicit configuration.